A Citizen’s Basic Income is an unconditional, nonwithdrawable income paid to every individual as a right of citizenship. It is as simple as that. Citizen’s Basic Income has a number of different names: Citizen’s Income, Basic Income, Citizen’s Basic Income, Universal Basic Income. They all mean exactly the same: an unconditional income paid to every individual. The amount paid to an individual would not depend on their income, it would not depend on their wealth, it would not depend on their household structure, it would not depend on their employment status, and it would not depend on anything else. Every individual of the same age would receive exactly the same: the same amount, every week or every month, automatically. Older people might receive more than working age adults, younger adults less, and less for children. Does adjusting the amount with someone’s age compromise Citizen’s Basic Income’s unconditionality? No, it does not. What is unique about Citizen’s Basic Income, what matters, and what makes it work, is that it can be turned on at someone’s birth, and turned off at their death, that no active administration is required in between, and that nothing that anyone can influence, or that requires enquiry of any kind, can affect it. Once the computer knows someone’s date of birth, it never needs to ask about their age: it can seamlessly adjust the amount that an individual is paid as their age changes. Everyone of the same age would receive exactly the same income, unconditionally. Sometimes words are added, but they are not necessary. Citizen’s Basic Income is unconditional, so within the jurisdiction in which it is paid everybody gets it, so it is universal. There is no need to say that it is. Citizen’s Basic Income is unconditional, which means that it would not fall if other income rose, so it is nonwithdrawable. There is no need to say that it is. It is universal, and it is nonwithdrawable. But all we need to say is this: Every individual of the same age would receive exactly the same income, unconditionally. ‘Unconditional’: A CBI would vary with age, but there would be no other conditions: so everyone of the same age would receive the same CBI, whatever their gender, employment status, family structure, contribution to society, housing costs, or anything else. ‘Automatic’: Someone’s CBI would be paid weekly or monthly, automatically. ‘Nonwithdrawable’: CBIs would not be means-tested. Whether someone’s earnings or wealth increase, decreased, or stayed the same, their Citizen’s Basic Income would not change. ‘Individual’: CBIs would be paid on an individual basis, and not on the basis of a couple or household. The different definitions exhibit different emphases, but, apart from the fact that the same term, ‘unconditional’, is used with two different meanings, they are almost consistent with each other and they represent a consensus – and, after all, consensus is what definitions are about. A Citizen’s Basic Income is always as defined above, and anything that conforms to those definitions is a Citizen’s Basic Income. A Citizen’s Basic Income scheme is different: It specifies the levels of Citizen’s Basic Income to be paid to each age group, the frequency of the payments, and also the funding mechanism, which might be changes to the existing tax and benefits system, or maybe some other method. Consider two different Citizen’s Basic Income schemes: both would pay working age adult Citizen’s Basic Incomes somewhere around £70 per week, and different amounts for older and younger people; both would be largely funded by abolishing the Income Tax Personal Allowance and the National Insurance Contribution Primary Earnings Threshold; but one would abolish means-tested benefits, while the other would leave them in place and recalculate them on the basis that every individual in a household would now be receiving a Citizen’s Basic Income and that net earnings will have been changed by the abolition of the Income Tax Personal Allowance and the National Insurance Contribution Primary Earnings Threshold. The schemes would exhibit some very different effects. In particular, the scheme that abolished means-tested benefits would impose significant losses on low income households at the point of implementation, whereas the scheme that retained means-tested benefits would not. The latter would be politically feasible, whereas the former would not be (Torry, 2014; 2015a). Not so. The main problem with the Universal Basic Income that Rothstein discusses in his article is not its unconditionality: it is the flawed definition. As we have seen, the definition of Citizen’s Basic Income implies neither a particular amount, nor that means-tested benefits would be abolished, and it does not imply that the UBI would necessarily free people from paid employment. Rothstein has confused his particular Citizen’s Basic Income scheme with Citizen’s Basic Income. Distinctions matter. A Citizen’s Basic Income is always an unconditional income paid to every individual, without means test and without work test. A Citizen’s Basic Income scheme specifies the rate at which the Citizen’s Basic Income would be paid for each age group, and the funding mechanism. There are many possible Citizen’s Basic Income schemes. As Rothstein correctly suggests, his chosen scheme would have many disadvantages. As I have shown, an alternative scheme might exhibit none of those disadvantages, and might offer many additional advantages. Both of the schemes contain genuine Citizen’s Basic Incomes, but only one of them is desirable and feasible. A Citizen’s Basic Income is an unconditional, automatic and nonwithdrawable income for each individual as a right of citizenship. A Minimum Income Guarantee is very different: it is a level of disposable income below which a household is not allowed to fall. The amount of money that a government will need to pay to the household will therefore depend on the household’s income from other sources (earnings, pensions, interest on savings, other benefits, and so on) and on the composition of the household. The 1970s Canadian and US experiments were Minimum Income Guarantee experiments rather than Citizen’s Basic Income experiments. The fact that those experiments exhibited clear health benefits and very little employment market withdrawal suggests that a Citizen’s Basic Income might have similar effects, but because a Minimum Income Guarantee and a Citizen’s Basic Income are not the same, that cannot be assumed. In the final edition of the journal Renewal for 2017, Frederick Pitts, Lorena Lombardozzi and Neil Warner suggested that the experience of the Speenhamland reforms of 1795 were ‘an experiment in a kind of basic income’ (Pitts, Lombardozzi and Warner, 2017: 150). They were not. They were an extension of means-tested poor relief to the working poor. The supplements paid out of the rates were designed to fill the gap between the worker’s earnings and a specified minimum income that was related to the size of the family and the price of bread (Speizman, 1966: 45). The scheme was a Minimum Income Guarantee, and the supplements paid were a means-tested benefit. They were definitely not a Citizen’s Basic Income. The modern equivalents of the Speenhamland project are Working Tax Credits and so-called Universal Credit, and not Citizen’s Basic Income. Not only is a Minimum Income Guarantee different from a Citizen’s Basic Income: the effects would be different. The Speenhamland payments fell if earnings rose, and rose if earnings fell. The Speenhamland supplement therefore functioned as a dynamic subsidy. Because it rose if wages fell, employers who cut wages knew that the supplement would make up for the wage cut. A Citizen’s Basic Income would remain the same whatever the individual’s earnings, so it would be a static subsidy: that is, it would not rise if wages fell, so both employers and employees would know that if wages fell then employees’ families would be worse off. In the context of a Citizen’s Basic Income, both collective bargaining and the National Minimum/Living Wage would be even more important than they are now, and the effort to maintain them would intensify. Pitts, Lombardozzi and Warner are quite right to make a variety of criticisms of the Speenhamland approach. Means-tested in-work benefits such as the Speenhamland supplements, Working Tax Credits, and Universal Credit, do, as they suggest, ‘keep the cost of labour competitive with machines so that employers keep workers hanging on for longer than otherwise would be the case’; they do restrict ‘the freedom of workers to sell their capacity to labour to employers as equal parties to a contract’; and they do ‘render impossible the commodification of labour in a world still organised on the basis of the commodification of everything else’ (Pitts, Lombardozzi and Warner, 2017: 149–50). A Citizen’s Basic Income, on the other hand, would never compromise ‘the bargaining power of labour’, and so would not contribute to ‘falling or stagnating wages and deteriorating employment prospects’ (Pitts, Lombardozzi and Warner, 2017: 151). Indeed, by providing a secure financial platform on which individuals and households could build, a Citizen’s Basic Income would increase workers’ ability to start their own businesses, to turn down badly-paid jobs, and to argue for wage increases. The Citizen’s Basic Income enthusiasts that Pitts, Lomardozzi and Warner have in their sights are those who suggest that a Citizen’s Basic Income would be a useful response to an automated economy in which fewer human workers would be required. It needs to be said that we cannot know the future of the employment market. Previous periods of technological change have seen new jobs created at the same time as existing jobs have been destroyed, and whether current and future technological change will have similar or different effects we cannot know. It is the fact that we cannot know the future shape of the employment market that is the argument for Citizen’s Basic Income. The benefits system that we are running in the UK is still a combination of the Poor Law and Speenhamland – that is, means-tested benefits both in and out of work. It is a system designed for a 1940s employment market characterised by long-term full-time jobs. This is even more true of Universal Credit. But the world has changed, and it will continue to change in ways that we cannot now predict. What we shall need is an income maintenance strategy that makes no assumptions about the future structure of the employment market, that incentivises employment, that provides as much freedom as possible for workers to choose how to deploy their labour, and that does not depress wages. Today’s benefits system is precisely what is not required. A Citizen’s Basic Income might be the best option. The Citizen’s Basic Income debate is important, it is increasingly lively, and the number of organisations and individuals engaged with it is increasing rapidly. If the debate is to be rational then it is essential that all of the players should agree on definitions, and that they should use them consistently. Rothstein tells us that he is discussing Citizen’s Basic Income, whereas in fact he is discussing a particular Citizen’s Basic Income scheme. Pitts, Lomardozzi and Warner tell us that the Speenhamland payments were a kind of Citizen’s Basic Income, whereas in fact they constituted a Minimum Income Guarantee: something entirely different. Such confusions are not helpful. What the Citizen’s Basic Income debate requires is not erroneous comparisons but high-quality research, careful logic, clear distinctions, and agreed definitions that everybody adheres to. This appendix is based on the EUROMOD working paper Torry, 2018c. For further details, and for the calculations and results relating to marginal deduction rates, please see the working paper. A Citizen’s Basic Income for every UK citizen, funded from within the current tax and benefits system. Current means-tested benefits would be left in place, and each household’s means-tested benefits would be recalculated to take into account household members’ Citizen’s Basic Incomes in the same way as earned and other income is taken into account. As a previous working paper has shown (Torry, 2014), a Citizen’s Basic Income scheme that abolished existing means-tested benefits, and that was funded purely by making adjustments to the current Income Tax system, would generate significant losses for low income households. A Citizen’s Basic Income scheme that both abolished existing means-tested benefits and avoided losses for low income households would need additional funding from outside the current tax and benefits systems. In the foreseeable future such additional funding is unlikely to be forthcoming. In the longer term a Citizen’s Basic Income large enough to enable current means-tested benefits to be abolished while avoiding losses for low income households might be possible, but Torry 2014 suggests that in the short term any feasible implementation of a Citizen’s Basic Income will need to leave the current means-tested benefits system in place. The research behind the working paper on which this appendix is based was guided by the same principle as previous working papers (Torry 2014; 2015a; 2016a; 2016b; 2017b): that is, as few changes as possible would be made to the current tax and benefits system, consistent with the other aims in view: revenue neutrality (Hirsch, 2015: 11, 25–28, 33), which I shall take to be a net cost or saving of no more than £2bn per annum; and the avoidance of significant losses, particularly for low income households. I shall also assume that raising Income Tax rates by more than 3 percentage points would be politically infeasible (Hirsch, 2015: 3–5, 25–28), but that equalising National Insurance Contributions at 12% across the whole earnings range would be just, sensible, and acceptable. The research discovers the levels at which Citizen’s Basic Incomes could be paid under these conditions, and evaluates the scheme in relation to poverty and inequality indices, the numbers of households able to escape from means-tested benefits, and household disposable income gains and losses. Unconditional Child Benefit is increased by £20 per week for each child. National Insurance Contributions (NICs) above the Upper Earnings Limit are raised from 2% to 12%, and the Primary Earnings Threshold is reduced to zero. This has the effect of making NICs payable on all earned income at 12%. (This seems to me to be an entirely legitimate change to make. The ethos of a flat rate benefit such as Citizen’s Basic Income is consistent with both progressive tax systems and with flat rate tax systems, but not with a regressive tax system (Atkinson, 1995)). The Income Tax Personal Allowances are set to zero. Income Tax rates are adjusted as required in order to achieve revenue neutrality. This part of the evaluation is based on the effects of the Citizen’s Basic Income scheme on household disposable incomes rather than on individuals’ disposable incomes. There are good arguments for both approaches. It is individuals who receive income, so gain or loss is an individual experience; and within a household income is not necessarily equitably shared, so the amounts that individuals receive might be more relevant than the amount that the household receives. However, we can assume that in most cases income is pooled within households, at least to some extent, so if one member gains and another loses then the household might be better off, and that might be a more significant factor than that one member of the household has suffered a loss in disposable income. Because households are of different sizes, an absolute gain or loss is not particularly relevant. However, percentage gains and losses are relevant, so this is the measure that we use. Table 1: An evaluation of an illustrative Citizen’s Basic Income scheme with the working age adult Citizen’s Basic Income set at £63 per week for fiscal year 2017-18. Net cost of scheme £2bn p.a. We can conclude that the scheme would be revenue neutral (that is, it could be funded from within the current income tax and benefits system); that the increase in Income Tax rates required would be feasible; and that the scheme would not impose significant numbers of significant losses on low income households. In theory there should be no losses for low income households because current means-tested benefits would still be in place and would be recalculated to take account of households’ Citizen’s Basic Incomes and changes in net incomes. Further research on the detail of the Family Resources Survey data would be required to discover the particular household circumstances that generate losses. Losses for higher income households will be due to increased Income Tax and National Insurance Contribution rates on higher earnings. We can conclude that the scheme would be financially feasible. Tables 2 and 3 give the results of calculations based on microsimulation of the current Social Security scheme and of the Citizen’s Basic Income scheme. by one fifth the number receiving more than £200. A lot of households would find it far easier to come off means-tested benefits than they do now. Table 4 shows the changes that the illustrative Citizen’s Basic Income scheme would bring about in relation to poverty and inequality. even more significantly, child poverty would fall by a half, and working age poverty would also fall substantially. 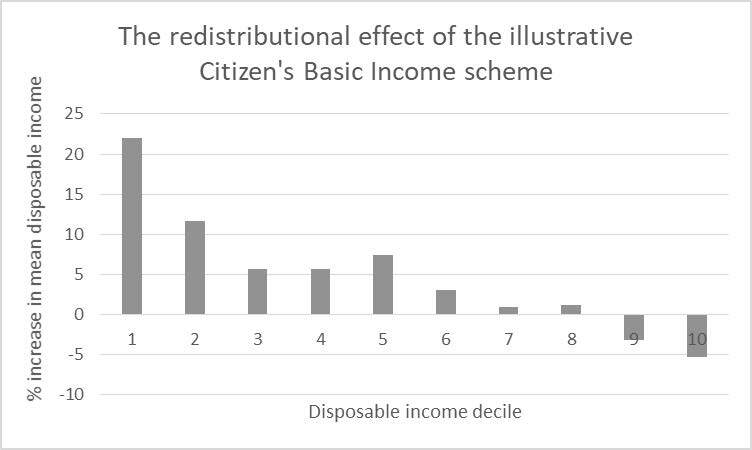 Table 5 and figure 1 show the aggregate redistribution that would occur if the Citizen’s Basic Income scheme were to be implemented. The table and graph show that the scheme would achieve manageable and useful redistribution from rich to poor, with those households often described as the ‘squeezed middle’ benefiting from the transition as well as the poorest households. the entire scheme could be implemented very quickly. This simple scheme would substantially reduce poverty and inequality; it would remove large numbers of households from a variety of means-tested benefits; it would reduce means-tested benefit claim values, and the total costs of means-tested benefits; particularly for the large number of households no longer on means-tested benefits, it would provide additional employment market incentives to the extent that marginal deduction rates affect employment market behaviour; it would avoid imposing significant numbers of losses at the point of implementation; and it would require almost no additional public expenditure. This simple illustrative scheme could be both feasible and useful. Atkinson, A.B. (1995) Public Economics in Action: The Basic Income / Flat Tax Proposal, Clarendon Press, Oxford. Department for Work and Pensions (2003) Tax Benefit Model Tables April 2003, London: Department for Work and Pensions Information Centre, Information and Analysis Directorate. Torry, Malcolm (2013) Money for Everyone: Why we need a Citizen’s Income, Bristol: Policy Press. – (2016e) How might we implement a Citizen’s Income, London: ICAEW, www.icaew.com/-/media/corporate/files/technical/sustainability/outside-insights/citizens-income-web—final.ashx?la=en; for a report on the consultation, see http://citizensincome.org/news/icaew-report-on-implementing-citizens-income/. This paper is based partly on Torry, 2017a; 2018a; 2018b; 2018c. I am most grateful to Alari Paulus of the Institute for Social and Economic Research for considerable assistance with the original working paper EM 12/17. The results presented here are based on EUROMOD version H1.0+. EUROMOD is maintained, developed and managed by the Institute for Social and Economic Research (ISER) at the University of Essex, in collaboration with national teams from the EU member states. We are indebted to the many people who have contributed to the development of EUROMOD. The process of extending and updating EUROMOD is financially supported by the European Union Programme for Employment and Social Innovation ‘Easi’ (2014–2020). The UK Family Resources Survey data was made available by the Department of Work and Pensions via the UK Data Archive. The results and their interpretation are the authors’ responsibility. Opinions expressed in this paper are not necessarily those of the Citizen’s Basic Income Trust. For the calculation, see the working paper Torry, 2018c. For details of the method, see the working paper Torry, 2018c.